Get ready to rock around the Christmas tree! We’ve listed 10 quick wins for Shopify retailers to increase conversion and sales merchants can put in place in no time to optimize their stores this holiday season. Dust off those jingle bells! The holiday season is just around the corner for online retailers and before you know it Black Friday and Cyber Monday will be upon us. Fortunately there are several quick wins Shopify merchants can put in place in no time to optimize their stores this holiday season! 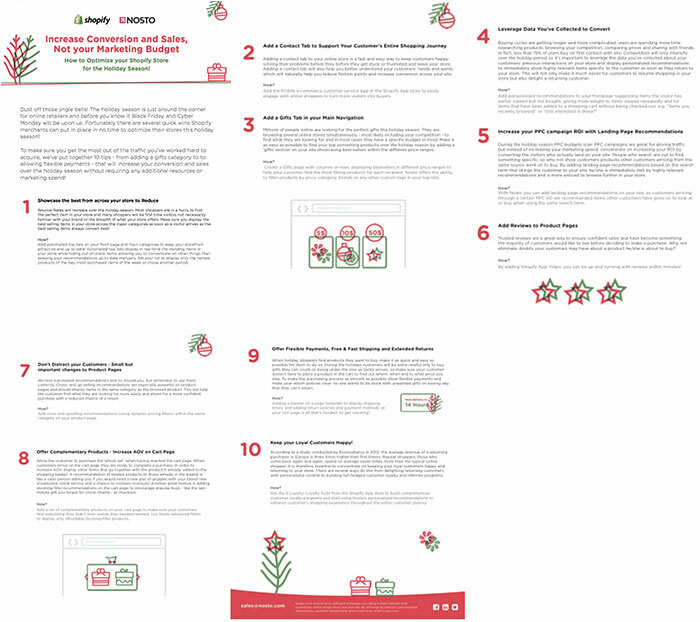 To make sure you get the most out of the traffic you’ve worked hard to acquire, we’ve put together 10 tips – from adding a gifts category to to allowing flexible payments – that will increase your conversion and sales over the holiday season without requiring any additional resources or marketing spend!